The sequel curse is something that has plagued franchises for decades now. How can a series of sequels hope to capture the lightning in a bottle of the first installment? With Thor: Ragnarok, the third film in the series, was it able to rise into a legendary pantheon or does it belong in the underworld? I can safely say that Ragnarok rocks. From director Taika Waititi, this is a very different film from the first two in the Thor series. By different, I mean by tone, art direction, comedy relief, and overall quality. Starring Chris Hemsworth as the God of Thunder, Thor, we see a very different take on the Marvel Comics mainstay. 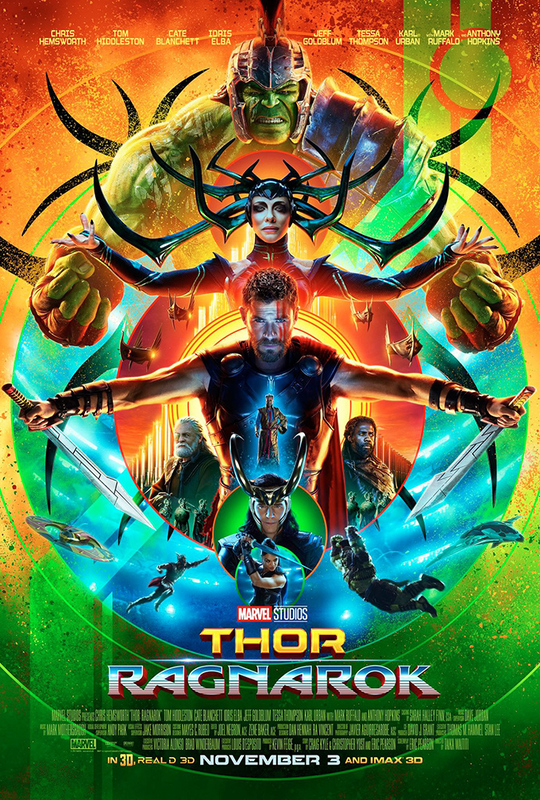 When a new evil rears its head in the form of the villainous Hela (Cate Blanchett), Thor, alongside his brother Loki (Tom Hiddleston), must fight to save Asgard. But not all goes as planned as Thor ends up on the planet Sakaar and in the middle of an intergalactic gladiator fight with everyone’s favorite green Avenger, The Hulk (Mark Ruffalo). We see the return of quite a few staples in the Thor films, as Odin (Anthony Hopkins) returns, as does the all-seeing Heimdall (Idris Elba). New characters include the mastermind behind the fights on Sakaar, the Grandmaster (Jeff Goldblum), the troubled Valkyrie (Tessa Thompson), and more. The latest breakout character for me comes in the form of the rock man Korg, voiced by the director, Taika Waititi. With a voice that shocks you from the beginning, Korg delivers some of the best moments in the film. What this film as more than any other Thor entry is humor. From the opening scene to the very end, the humor is on point throughout the span of the film. Whether its between Thor and Loki as they banter back and forth, from Bruce Banner’s awkwardness, and the best laugh of the film at the end from Korg, this is an extremely funny movie. But it also moves the story along nicely, and to a brand new starting point for Thor and company. No longer stagnant, the status quo is thoroughly shaken, not stirred, and primes us all for Avengers: Infinity War. Easily the best of the Thor films and one of the best Marvel Studios films yet, Thor: Ragnarok didn’t bring the end like its name implies, but rather a bright new beginning for Marvel’s godly Avenger.